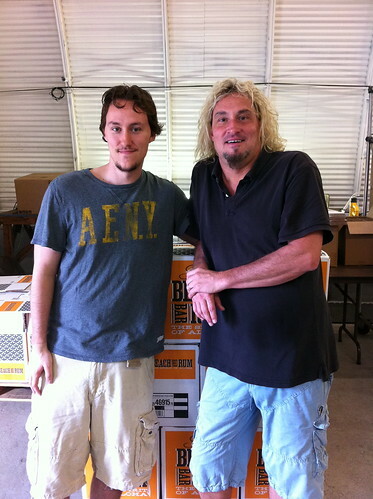 Sammy Hagar and Mark Nigbur, Photo courtesy of Dave and Derek, Shook on the Go! When a rock star launches a liquor you know there will be a great party and gorgeous marketing, though it rarely happens in Maui. So when I the invitation (packaged in the form of a parchment titled “There’s going to be a RUM-ble” and rolled into a glass bottle with a cork), I knew it was going to be fun. There were shots of Sammy’s Beach Bar Rum served neat lined up all over the bar. I took a quick lesson from James Shoemaker, distiller intern and Maui qualifier for the Don the Beachcomber MaiTai contest, on tasting a fine distilled rum (Dan Beaudry of Haui’s Life’s a Beach helped, too). “Hold it deep in the back of your throat for a few seconds, and breath through your nose,” Shoemaker said. With a side glance at Beaudry, we downed the white rum and savored the flavors. It was incredibly smooth. Next up was my celebrity photo op. 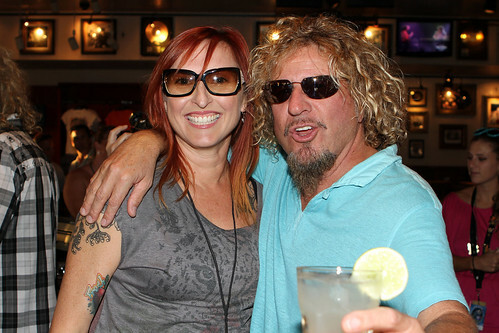 Not used to such appearances, I was a little shy, but some quick coaxing from the photographers told me not to miss my chance to get my photo with Sammy Hagar. 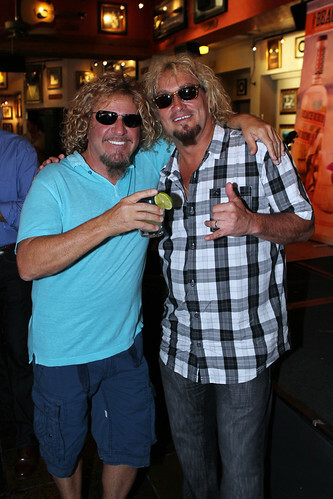 Hagar is a character, as smooth as his rum. He was happy to chat with us and sip Beach Bar rum “rocktails.” Hard Rock was serving the rocking daiquiri, the Maui Mai Tai and the Maui Libre, all from the rocker’s own Beach Bar library of drinks. Hagar is no freshman when it comes to making liquor. His Cabo Wabo is the number two selling tequila in the U.S., and he cashed out for $80 million. 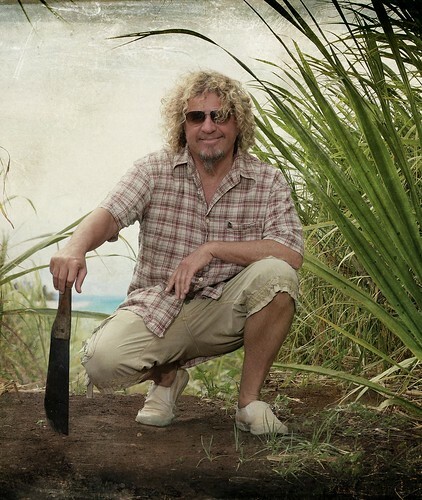 But Hagar is looking at this new rum project a little differently. Right now Beach Bar Rum is only available in Hawaii. The proceeds from his launch party went to the Hana Youth Center’s “Walk in My Shoes” fundraiser campaign, and Hagar continues to stay close to the community of Maui by donating to many non profits that focus on kids. The magic behind the Beach Bar Rum begins with the Maui turbinado sugar, obtained from Hawaiian Commercial & Sugar. It ends at the hands of Master Distiller Mark Nigbur at his Hali’imaile distillery. Nigbur designs his own stills and developed the rum for Hagar. Nigbur could also be Hagar’s doppelgänger, and after their chance meeting a few years ago it was an instant friendship (check out this video of Mark talking about their meeting with Melissa Chang). Nigbur and his son Cory handle the creation of the rum from the mash recipe, to his unique one-of-a-kind stills, as well as bottling and boxing. In a blind tasting Hagar chose Nigbur’s rum sample, and the rest is history. You can sample some of this Maui distilled spirit at Hard Rock Maui, David Paul’s Island Grill, Royal Lahaina and Castaway Cafe on the Westside. You will find it at Sarento’s, Haui’s Life’s a Beach and the Marriott Wailea Pool Bar in South Maui, and the Hali’imaile General Store. It’s also available at Foodland, Walgreen’s and Cash and Carry.